Recently, I finished my first sewing project in anticipation of our baby girl due in August. As with any task, the right tools can make all the difference. This week’s Top 5 list is made up of the items and resources that I have found to be most helpful as a beginner seamstress and quilter. 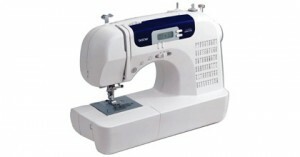 A trusted name for home sewing machines, Brother offers a wide variety of products at very affordable prices. Even used on the popular fashion design competition program Project Runway, their machines are known for their abundance of features. 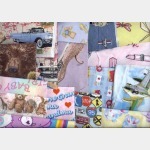 Serging, sewing, embroidery, quilting, and multi-needle options are available. Brother designs machines for people at all levels of expertise. The model I currently use is the CS-6000i. I received this as a surprise gift from family members for our wedding, and couldn’t be happier. Since I enjoy various types of sewing (craft ideas, home décor, clothes, and quilting) this style fits my needs perfectly. It is lightweight, programmed with 60 different stitches, auto-sizing buttons holes, and has extremely quick and easy bobbin setting and needle threading. It is very user friendly, yet has more options than a straight-stitch machine. I have been using it for the last 5 years and have yet to encounter any problems or any tasks that it was unable to handle. At the website not only will you find information on the latest technology available, you can also access software, designs, videos, supplies, customer support, and become part of the online community. Whether it’s for children’s costumes, a quilted table runner, or just adding a patch to a hole in your favorite jeans, a good basic machine is an asset to any home. 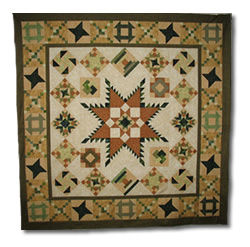 I attribute a great deal of my love and passion for quilting to Country Traditions. Located in downtown Fremont, Nebraska, this store is a quilt lover’s dream. A huge retail space occupies the main floor hosting thousands of bolts of material, along with all the notions one could ever need to create an award-winning masterpiece. They also have fun decorative items and numerous projects on display. If you are new to the craft, or just want to socialize with other fellow quilters, this is the place to be. All throughout the year the upper levels of the store location are dedicated to classes and seminars. Having never quilted in my life, I took my first beginning class from the ladies here. After only 6 weeks I learned all of the basics and even had a crib sized quilt to show for my efforts. The experience and education was outstanding. I wish we still lived in the area so I could take additional classes and join in on the shop hop bus trips. You can keep up with their latest updates and signup to receive newsletters including the block of the month through their website. However, if you are ever in Eastern Nebraska take some time to stop by Country Traditions, it might just inspire you to be the next great quilter. You can’t start a sewing project without some type of fabric. The industry has taken off and nowadays you can find everything from batiks to tractor print materials on the market. The down side to all of this variety can be finding it all in one place and at a good price. A few yards of this, a half yard of that, a couple spools of thread, some accessories, and before you know it you can rack up hundreds of dollars before you even get going. I was pleasantly surprised when I was introduced to the site 4my3boyz.com when searching for a specific character pattern. Dealing exclusively in fabric, this site is one of the most comprehensive when it comes to styles, panels, bundles, and unique types of material. The best part, their prices are hard to beat. The website offers dozens of categories to browse through including, animals, floral, holiday, sports, religious, and even food themed designs. You can purchase by the yard or in fat quarters. If you are looking to make an Elvis Presley pillow for your great-aunt or want to beef-up your supply basket with a scrap bag of various remnants, 4my3boyz should be your first stop on the web. Sew Fun is a cheery site that encourages the use of bright fabrics and unique ideas. It helps bring the joy back into the process. Some of their latest patterns include those for adorable baby sneakers and a new strap clutch for spring. The site has a lovely shop where you can purchase patterns, products, and hardware. Additionally they provide tutorials and entertaining blog posts. Free Sewing Patterns is another cute blog that shares great ideas from across the web. With a varied selection you can search by difficulty and through numerous categories. It also includes helpful instructional videos and is a fantastic place to discover new sites since she is constantly linking to other’s patterns. And of course, one of the best parts, it’s free! Free Patterns: I wouldn’t label myself as a cheapskate, I prefer “frugal” and anytime I can access information and ideas at no cost, I’m all over it. So this third site is another free one, as well. The name is pretty straight forward and delivers exactly what it says, FreePatterns.com. With over 4 million members it is probably the leading site for all craft samples. Beyond just sewing and quilting you can search knitting, beadwork, paper crafts, and much more. It’s easy and free to join, just provide your email address and you can start downloading patterns today. So you have your idea, the pattern is all picked out, and you just found the perfect fabric. You go up to the counter and they ask you that dreaded question, “How much do you need?” Even though you knew they were going to ask you, your mind draws a blank and you begin to stammer unintelligible numbers a mix of inches, yards, and ummms. This was me just a month ago. Thank goodness the store assistant was patient and helpful. She grabbed a calculator and we fumbled through some basic estimates. I usually try to buy extra in case of a mishap, but especially with large projects, purchasing fabric can be a little nerve-racking. Cue the handheld device; now there is an app for calculating yardage. The Quilter’s Little Helper; Essential Quilting Calculator, a free application available for Android and iOS, is a creation by Robert Kaufman Fabrics. No longer do you need to scratch down dimensions, break out the calculator, divide by 12, and hope for the best. This app is full of useful features. The quilting calculator provides basic conversions of inches to yards, estimates for backing sizes, formulas to determine how many cuts you can get from one piece, binding, boarder, and even block sums. It takes the guesswork out of figuring which saves everyone’s time, makes you look good, and will give you added confidence when biting the bullet at the cutting station. Are you a budding seamstress/quilter or a veteran to the art? What are your favorite products for sewing? Do you ever use apps for estimating yardage? Feel free to email me or add your suggestions below, I’d love to hear your comments and ideas. I have a Brother 6000i as well. It was my primary machine for a time, then moved to a back-up role after I had my deceased mother-in-law’s old Kenmore refurbished. Recently the Kenmore developed an electrical problem so the Brother machine is now my primary machine again. I had forgotten how nice it is to have a needle threader! Fabric.com is another great resource for your textile needs. They always have reasonable prices and I appreciate their 37″ yard. Sometimes that extra inch comes in handy when I’m squaring up the fabric or trying to match a pattern. Yes, the needle threader is one of those great little luxuries in life. And thank you very much for the suggestion of Fabric.com; this site is wonderful! They have a big selection and good prices. It is now one of my top bookmarks. 37″ is so nice, it is surprising how much of a difference that little bit can make. I will definitely be using this site in the future. Thanks again!